Nearly all web browsers default to keeping a list of recent searches which are easily retrievable as part of the browser history. Safari shows this recent search list when the URL bar is clicked into with the cursor, revealing the 10 most recent web search terms or phrases. 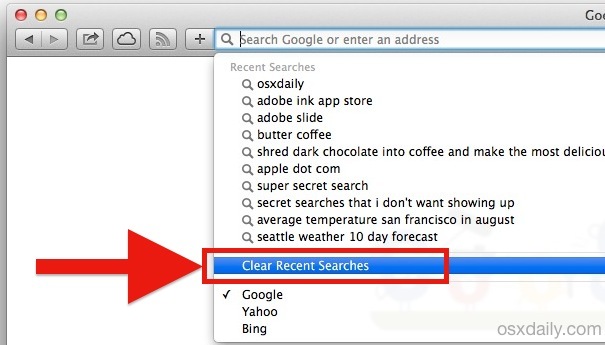 That recent search list can be convenient as it makes quick retrieval of prior search items easy, allowing for a quick return to past results without digging around in Safari’s history menus, but there are also times when you may not want that list to show anything at all, or at least want to clear out that recent search list in Safari for privacy purposes. All those search terms? That’s what we’re going to delete, resulting in a blank slate. The option is the same as before, getting to it is all that’s different. The effect should be immediate, click back into the URL box should now pull down a list to reveal… nothing at all. The Recent Searches list is now blank. In new versions of Safari, you must click the magnifying glass, in prior versions you could just click the search bar. Either way, pulling down the search list will reveal the “Clear Recent Searches” search history menu. For those who want to more thoroughly dump details from Safari, you may want to also clear out general browsing history and dump Safari cookies too, though that’s really up to the user. * Note that newer versions of Safari have an single box for entering URL’s directly or searching, much like Chrome, while older versions of Safari have a separate search box. Therefore, newer versions of Safari follow the above directions, while older versions of Safari require the user to click into the search box rather than URL box, the remainder is the same. For most of us, the recent search list is more convenient than intrusive, and so clearing this out doesn’t really matter much. Remember, you can always temporarily prevent Safari from keeping any browsing and search records by using Private Browsing on either the Mac or iOS if you just want a temporary boost to privacy while secret gift shopping or using a public computer. Can you do this in Safari on the iPhone without clearing out every cache and history through Settings? iOS makes this kind of thing tougher than it should be… ironic when it’s supposed to be easier. If you use google on iOS, just go to google.com and tap the search bar. The recent searches should come up and there is an option to delete them. I wish, I could set “Private browsing” in the Safari preferences. Why is this so problematic for Apple? “Clear Recent Searches” should be near the very end of the list, the text is quite small but it’s there in Safari. In my Safari (6.1.5 on Mountain Lion) there is not. Done, searches cleared in Safari, all versions of OS X, all versions of Safari. Why are people so bad at reading instructions? Does anyone bother reading and trying something with your own Safari before leaving a comment? 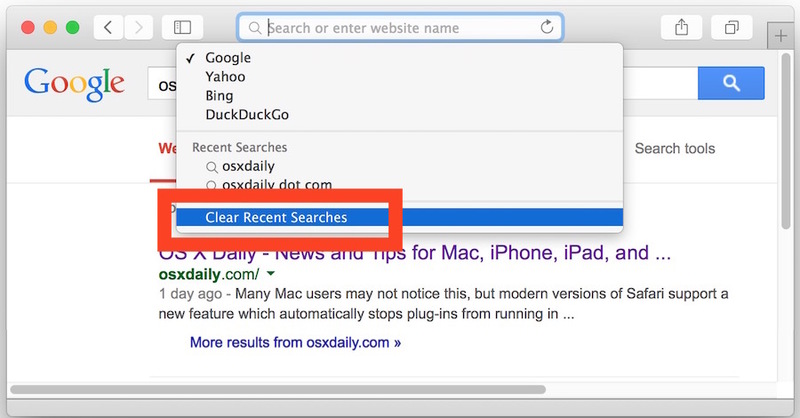 There is no ‘clear recent searches’ in Safari 7 either so this does not work. Thank you – I just got a new computer with Yosemite (coming from Snow Leopard, with a separate search box) and I couldn’t figure out where the “Clear Recent Searches” option was – it was driving me crazy. This article is accurate. ‘Clear recent searches’ appears in the drop down as suggested in the article.